How does exports benefit to exporters in India? What are the financial assistance to exporters? Advantages of Exports in India? What are the different government schemes to exporters? How does bank help exporters financially ? Different financial schemes and other supports of Export Promotion Councils. Who are the organizations and agencies supporting exporters in India and how? The below mentioned export benefits, schemes, financial assistance and other support to exporters in India by government and other different agencies could be withdrawn or modified. The actual beneficiaries may reconfirm with the concerned authorities whether such export benefits are valid. MEIS scheme for exporters was introduced in recent Foreign Trade Policy of India 2015-20 by consolidating previous different schemes such as Vishesh Krishi Gram Udyog Yojana (VKGUY), Focus Product Scheme (FPS), Agri-Infrastructure Incentive Scrip), Market Linked Focus Product Scheme (MLFPS) etc with modification. MEIS scheme extends benefits to more than 5000 export items and the duty credit scrips helps exporters in payment of Customs Duties for import of inputs or goods, payment of excise duties on domestic procurement of inputs or goods, payment of service tax on procurement of services, payment of Customs Duty and fee etc. I have written detailed articles about MEIS scheme in this web blog and you may read in detail here. The foreign Trade Policy of India 2015-20 introduced SEIS (Service Exports from India Scheme) for service exporters by modifying SFIS scheme of previous years by benefiting all service providers of India including foreign brand of Indian Companies. Detailed articles about SEIS have been written in this web blog, you may click here to read. Trade promotion council of different products and commodity boards helps exporters with various financial schemes and other service assistance. Market Development Assistance (MDA), Market Assistance Initiative (MAI), Financial support to attend Trade Fairs, various information supports etc. are some of them. Click here for details. You may also contact concerned trade promotion council and commodity board for more details. As per foreign trade policy of India, inputs are allowed to import without duty payment for export purpose. The licensing authority fixes value addition on export products not below 15%. A stipulated period to import is allowed and validity for export obligation. For more details, contact nearest DGFT office (Director General of Foreign Trade, Government of India). I have mentioned a short note on Advance Authorization Scheme in this web blog separately, you can click here to read. Advance Authorization for annual requirement is also issued for items having standard input output norms those exporters having past export performance, minimum preceding two financial years. Service tax refund paid is reimbursable on specified output services used for export of goods at specified all industry rates fixed time to time by the authority. DFIA (Duty Free Import Authorization) scheme is the export scheme introduced by DGFT by clubbing DEEC (Advance License) and DFRC to support exporters for free import of inputs. I have written a separate updated article in detail about Duty Free Import Authorization (DFIA). You may click here to read. Income tax exemption to exporters are allowed by government in different categories. You may contact your nearest Income Tax Department to know latest updated information on income tax exemptions to exporters in India. No sales tax is required to pay for exports. The facility is extended to the suppliers of goods for export also. Value Added Tax (VAT) is also exempted for export goods. The details of such exemption of sales tax / VAT is available with the concerned Sales Tax Department. Read more How to get exemption of Sales Tax under exports Is sales tax applicable on shipments effected under high sea sales How does CENVAT Credit work? Many financial assistances with different schemes are given to exporters to boost exports in India. Pre Shipment Credit in Foreign Currency (PCFC) and in INR, Packing Credit loans, Supplier’s credit, Buyer’s credit, Post shipment Finance, short term and long term finance, Finance for special export projects, Working capital finance, Capital Equipment Finance, Fund for export consultancy and technological services, different guarantees for exports like Advance Payment Guarantee, Performance Guarantee, Retention Money Guarantee, Guarantee for customs, central excise and other government and private agencies etc. Banks also provide financial assistance to Export Oriented Units (EOU), Special Economic Zones (SEZs), Corporates, STPs, EHTPs, FTZs, MSMEs etc. Bank also provides Line of Credit mechanism for export of projects, equipment, goods and services from India. Authorized banks also provide exporters to open Foreign currency account in the form of EEFC (Exchange Earners Foreign Currency) to help them in handling foreign currency easily without local currency fluctuation and to eliminate currency conversion charges. Many other services are also provided to exporters in India by authorized banks to boost exports for favourable balance of payments. Export Credit Guarantee Corporation (ECGC) protects exporters in covering credit risk of overseas buyers. Click here to read more. FIEO also plays a major role in promoting exports in India by assisting exporters in various ways. Chamber of Commerce at different parts of the country and Federation of Indian Chamber of Commerce and Industry (FICCI) help exporters in various ways to promote exporters in earning foreign currency to strengthen economy. The support from Exporters Organization formed privately also plays a major role in sharing practical problems facing by industry and helps to find solutions. Such exporter’s association takes up their issues with government time to time, so as to enable the government to introduce new policy or to amend existing one. Assistance to States for Infrastructural Development for Exports (ASIDE) has been introduced by Central Government with an objective to involve States / Under Takings in export effort by providing assistance to the State Governments or State Under Takings Administrations for creating appropriate infrastructure for development and growth of exports. Exporters and manufacturers from special region such as Sikkim, Jammu and Kashmir etc. are given specific benefits by government. The exporters can contact the related government agencies for more details. Export units holding special status are also eligible for different exports benefits from government modifying time to time. Export Units in Free Trade Zones can enjoy zero excise duty on goods manufactured for export purpose. Import customs duty is exempted for import of components used for manufacturing export goods. Domestic Tariff Area (DTA) sales up to certain rate is allowed. Many advantages like Foreign equity permission, income tax benefits, DTA sales up to certain limit and many other supports can be enjoyed for the units under STP. Import of second hand capital goods, re export of capital goods, income tax benefits, DTA sales up to certain limit and many other government assistances can be enjoyed by Export Oriented Units. income tax benefits, re export of capital goods, DTA sales up to certain limit and many other conveniences can be enjoyed from different government and non-government agencies to BTP. income tax benefits, re export of capital goods, DTA sales up to certain limit and may other export supports can be enjoyed by Electronic Hardware Technology Parks (EHTPs). Government provides many benefits to Special Economic Zones in India to create an internationally competitive and smooth working environment for exports and thereby economic development of the country. Some of the advantages enjoyed by SEZ are single window clearance, free import of goods, exemption of customs duty for import of capital goods, consumables, raw materials, spares etc, reimbursement of CST, 0% income tax for 5 years, Foreign Direct Investment, exemption on MAT, Service Tax, DDT, CST, Service Tax, External commercial borrowing facility etc. and many more. 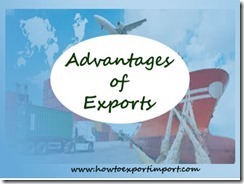 This post explains: How does exports benefit to exporters in India? What are the financial assistance to exporters? Advantage to exporters in India? What are the different government schemes to exporters? How does bank help exporters financially? Different financial schemes and other supports of Export Promotion Councils. Who are other organizations and agencies supporting exporters in India and how? 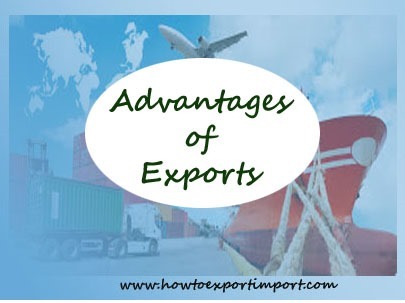 The above mentioned export benefits, schemes, financial assistance and other support to exporters in India by government and other different agencies could be withdrawn or modified. The actual beneficiaries may reconfirm with the concerned authorities whether such export benefits are valid. Trilok Shah: On 14 July 2016 What are the export benefits - cash incentive and import replenishhment licence againstg export of Zinc Oxide. Pl.send reply to eMail add. Nitin Khandelwal : On 10 August 2016 I am Interested in Import & Export Business & want to explore the business opportunities in the suggested industry. I am from Finance Background & had worked with MNC Bank for last Seven Years & from the last three years providing Financial Consultancy for various Companies in Delhi & NCR We have already got IEC in our Company. If you could share the further details like in which industry (Presently Profitable) ,Initial Capital to be infused ,Approximate Margins, Pros & Cons of the Business. G VASUDEVA RAO: On 20 October 2016 Sir, We are the merchant exporters of milk from Visakhapatnam to Singapore. We were given to understand that central government is encouraging merchant exporters by offering incentives on the quantum of business they have done, through EBRC. Please let us know the present status of incentives, in force or not. Joseph : On 21 November 2016 I've gone through your export related documentation in http://howtoexportimport.com.I've one doubt. Hope you will reply me.I'm new to export and got an order from USA. But it's not the product my company manufacture in Bangalore. We identified one company in Mumbai who can provide the items for export. They give best price if they can avoid excise duty and other export benefits if any.They want to export directly which we are against. We want to do it as a merchant export to protect the identity of our customer from them.1. Is it possible to do it? When we execute Bond/ARE-1 etc, do we need to mention the customer name and address in those forms? Will the manufacturer comes to know from any documents we give to them for avoiding excise duty?2. How can I make sure they will not know my customer details?Also, is it possible to give all export benefits to them so that I can get the best price from them? I'm not 100% sure, but I feel, they are registered under Export Promotion Facility. 3. I want to ship directly from Mumbai, without bringing it to Bangalore. Hope, there will not be any issues in that. They have given FOB price, so my worry is still about how to hide the customer details? RP Singh: On 17 April 2017 how can i export garlic in abroad. Neha Jain: On 27 April 2017 hi. we run a business which is 95% imports and selling in the indian market and 5% is exports - we are currently not claiming any duty drawbacks or other financial incentives for our exports business. need advice on that. we have 2 types of exports and need information specific to that a) product A is imported - all duties are paid and then it is reexported as it is without any changes. Can we get duty drawback or any other financial incentives for this? b) product a,b,c are imported. Product E is made using a,b,c and product d which is sourced in india. Can we get duty drawback or any other financial incentives for this we want a situation where we pay entire customs duty at the time of import but when we export we get the refunds wherever permissible c) we are exporting to srilanka and bangladesh - any special privileges for this? navin Krishnasamy : On 26 May 2017 I sell apartments and plots in Chennai. NRI Tamilians ie Indians buy and pay in dollars. Am I eligible for incentive? If so how much? CA PRADIP KUMAR SAHOO: On 08 June 2018 At present what are the export incentives available for Steel industry ?